SYSTRAN 8 Translator is a new machine translation software that helps consumers, freelancers and businesses to instantaneously understand foreign languages and exchange information securely and efficiently. 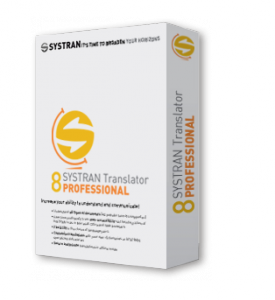 SYSTRAN 8 Translator is designed for individuals, freelancers and businesses who need to quickly translate all types of documents to better understand them. With a new user interface, it has become extremely simple to translate text, Web pages, Microsoft Office documents, emails, or to look up the definition of a word or phrase in a dictionary. As all features are accessible without an Internet connection, private or professional translations remain confidential. Furthermore, SYSTRAN 8 Translator provides the ability to customize the translation by creating user dictionaries and translation memories to improve the accuracy of translations.